Baroda Dynamic Equity Fund: Should You Be Investing In It? Home > Financial News. Simplified. > Baroda Dynamic Equity Fund: Should You Be Investing In It? The equity markets have been extremely volatile this year, while the bond markets too are not safe either. In fact, it has disappointed investors for a couple of years now. With both the prime asset classes being uncertain, is there a way out for the investors? It is noteworthy that the equity markets are moving towards fair valuations while the interest rates being almost at its peak, makes a case for good entry point with proper asset allocation. Fund houses too would like to tap on such opportunity, and promote funds that can offer the benefit of both these worlds, promising some level of safety through risk mitigation using dynamic asset allocation strategy. Baroda Dynamic Equity Fund (BDEF) is a new entrant from Baroda Pioneer Mutual Fund. It is an open-ended dynamic asset allocation fund. A dynamic asset allocation or balanced advantage hybrid scheme has the flexibility to manage its allocation to equity and debt dynamically, in order to generate returns by controlling the risk involved. A dynamic asset allocation fund typically has a dominant equity exposure and can vary its equity exposure between 0%-100%. Under normal circumstances, BDEF will hold an exposure between 65% to 100% to equities and equity-related securities and would not be restricted to any one of the market capitalisation segments. The fund will actively use asset allocation strategy to mitigate risk and may also allocate some portion (up to 35% of its total assets) to debt and money market instruments and units of REITs and InvITs (up to 10% of its total assets). Following a multi-cap strategy, the fund will have flexibility of choosing stocks from across market capitalisation segments. An open-ended dynamic equity scheme. If units are redeemed over and above the 10% limit, on or before one year from the date of allotment: 1% of the applicable Net Asset Value (NAV). How will the scheme allocate its assets? * Investment in securitized debt will not exceed 10% of the net assets of the Scheme. As mentioned earlier the Scheme has a dual objective of generating capital appreciation by investing in equity and equity related securities as well as generating income by investing in debt and money market securities, by managing risk from the market by active asset allocation. To achieve the objective, the Scheme will follow a top-down and bottom-up strategy. The top-down process will lead to the active ongoing asset allocation decision between equity and debt and the bottom up process would lead to construction of the portfolio using specific securities. For this the AMC will follow a proprietary model to arrive at asset allocation and understand the valuations and fundamentals of the companies. Earnings Yield-GSec – to capture the Market Risk premium through difference of earnings yield and 10-year Government Bond. 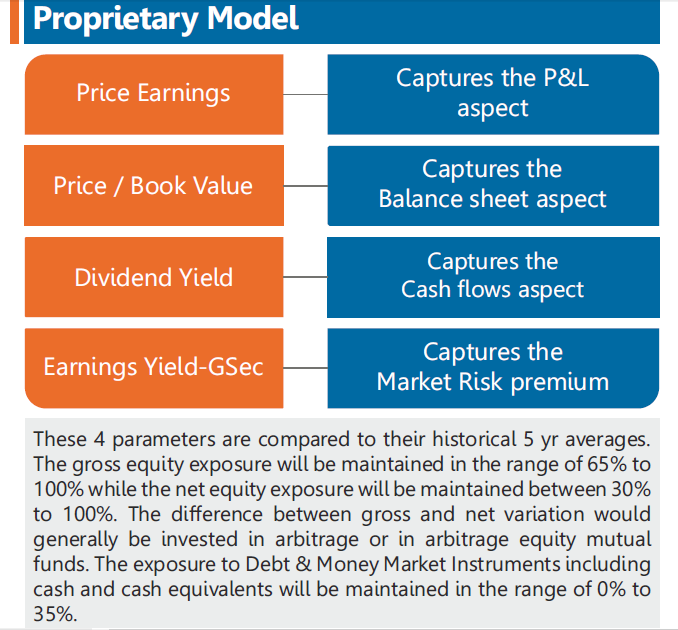 The fund house will assign different weights to different valuation parameters with more emphasis on the balance sheet and cash flow related parameters. If needed, the fund house will review the model with suitable adjustments, to ensure that the outcomes remain pertinent to the market environment. Overall, the fund will follow a Proprietary Model that uses 10-year back tested data for evaluating the Equity allocation based on a GARP (Growth at a Reasonable Price) philosophy with a top-down and bottom-up approach to construct the portfolio. The portfolio will be rebalanced monthly to capture the macroeconomic trends. 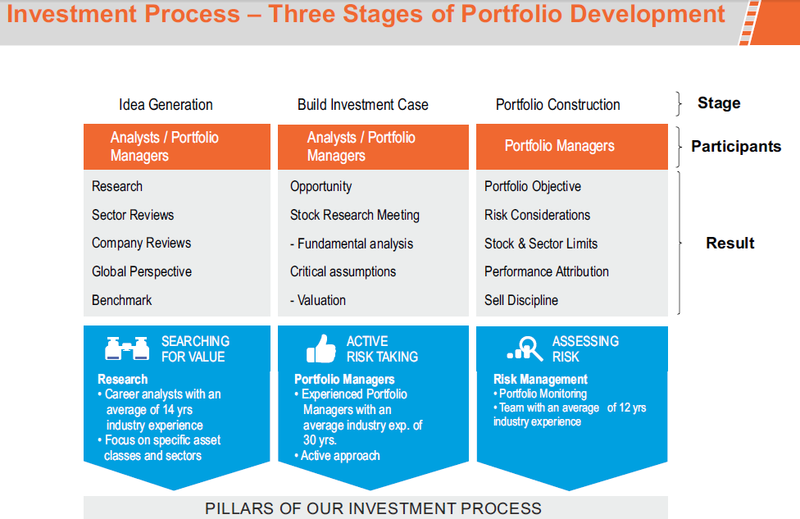 To construct the equity portfolio, BDEF will follow a combination of top-down and bottom-up approach. A top-down approach for sector allocation and a bottom-up approach to choose stock for Alpha generation, with a focus on high conviction ideas with a long-term approach to delivering growth for investors. While the gross equity exposure will be maintained in the range of 65% to 100% and the net equity exposure will be maintained between 30% to 100%. This difference between gross and net variation would generally be invested in arbitrage or in arbitrage equity mutual funds. The model would follow the matrix approach for asset allocation based on different parameters. Once the asset allocation has been decided based on the model, the portfolio would be constructed based on top-down as well as bottom-up approach using the fund’s core principle of investing, GARP. The Scheme retains the flexibility to deviate from the asset allocation model, depending on the market conditions, market opportunities, applicable regulations and political and economic factors. The Baroda Dynamic Equity Fund will be managed by Mr Sanjay Chawla (Equity) and Mr Alok Sahoo (Fixed Income). Mr Sanjay Chawla is the Chief Investment Officer of Equities at Baroda Pioneer Asset Management Company Limited. He holds a degree in Master of Management Studies (MMS) from BITS, Pilani. Mr Sanjay Chawla has over 29 years of experience in fund management, equity research and management consultancy. Prior to joining the AMC, he has worked with Birla Sun Life AMC as Sr Fund Manager-Equity, managing various schemes with different strategies. Mr Chawla has also worked as Head of Research with SBI Capital Markets and in various capacities in the equity research space in Motilal Oswal Securities, IDBI Capital Markets, SMIFS Securities, IIT Invest Trust & Lloyds Securities. He is the lead fund manager at the AMC, few schemes that he manages include Baroda Pioneer Multi-Cap Fund, Baroda Pioneer ELSS’96 Fund, Baroda Pioneer Hybrid Equity Fund, Baroda Pioneer Large cap Fund and Baroda Pioneer Mid-cap Fund. Mr Alok Sahoo is the Head of Fixed Income at Baroda Pioneer Asset Management Company Limited. He is a management graduate in Finance from XIM, Bhubaneswar, with a BE degree from NIT, Rourkela. He has been working in the investment area in asset management for more than 17 years. Prior to joining the fund house, he was a fixed income fund manager at UTI Mutual Fund and at HSBC Mutual Fund. He was also the Fund Manager for the Employee Provident Fund at HSBC Asset Management. He has experience in the credit research of companies as well. Currently, Mr Sahoo manages Baroda Pioneer Liquid Fund, Baroda Pioneer Treasury Advantage Fund, Baroda Pioneer Short Term Bond Fund, Baroda Pioneer Dynamic Bond Fund, Baroda Pioneer Credit Risk Fund and Baroda Pioneer Short Duration Fund. Aim of the Baroda Dynamic Equity Fund is to tap the dual potential of equity and debt for over a longer horizon. To navigate you through this current market volatility and help you achieve your financial goals; the fund house has launched this as a tailor-made solution for all the market times. In the current market conditions where small-cap and mid-cap companies are hammered, and so have large caps tumbled; it provides an opportunity to do some value buying to the fund managers. However, amidst the extreme turbulence constructing the portfolio would not be easy and may inflict very-high-risk. The investment by fund managers in debt & money market securities is to position the portfolio at the favourable levels by dynamically managing the fund across Duration & Credit to avoid extreme risk at the short-term. The elevated yields at present provide good opportunities but focusing on credit quality would also be imperative to reduce risk to capital. Amidst the macroeconomic uncertainties looming, the fortune of the fund would closely be linked to how the fund manager plays the investment strategy in the endeavour to accomplish the investment objective of BDEF. At PersonalFN to handle the turbulence of the Indian equity market we can guide you to invest in the world of finance and enable you to take control of your personal finance. What if YOU knew what metrics to use to judge a mutual fund upon? What if YOU knew where to invest your savings now? What if YOU knew how to hedge your risks for today and tomorrow? You don’t have to blindly rely on your financial advisor for that. With our Comprehensive A To Z e-Course, you don’t have to be in the dark anymore. PersonalFN’s Money Simplified e-Class Video Series can make you a successful investor or you can play it safe for a happy retirement, this e-Course aims to make you capable of figuring out your life goals and objectives on your own while preparing the ultimate strategy for yourself. Subscribe now to become your OWN financial planner.